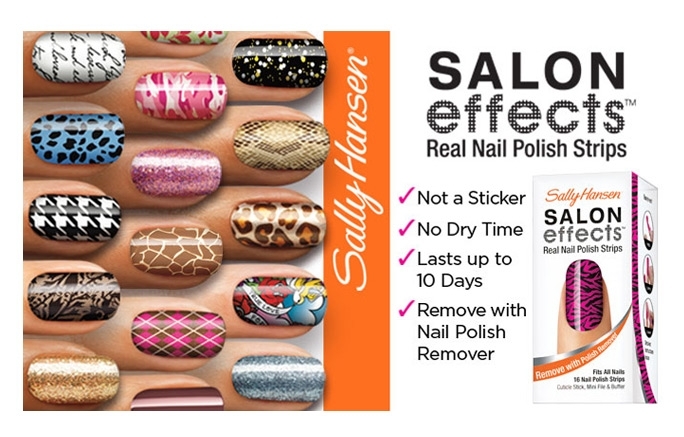 If you haven't tried Sally Hansen's Salon Effects by now, you are missing out. I know that it is hard to decide what to buy with so many different versions of similar products in the market, but did you know that these strips are different? 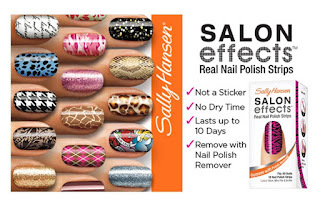 A lot of the other brands out there have fake press-on nails or "stickers", but Sally Hansen Salon Effects are made with REAL nail polish. Skeptics out there may be saying "real nail polish, why not just paint your nails then?" The answer is simple: Salon Effects are WAY better than painting your nails. Not only is the drying time zero and there are 40 designs with cute names (like a pink camo called "booty camp"), but these nail strips last up to 10 days. Find me a nail polish that does that! I was super excited to test out Kitty, Kitty. 2) Peel - remove the clear protective plastic cover, then peel nail polish strip from backing paper. 3) Break- Choose the side of the strip that bests fits the shape of your cuticles & break off the silver tab on the strips. 4) Apply- Place the strip against the cuticle line. Hold strip at the center for maximum control. You can gently stretch for a perfect fit. Firmly smooth over entire nail. Run the flat side of the cuticle stick along the edge of strip to firmly bond strip to nail. 5) Shape- Smooth excess over nail edge, forming a crease around the edge of the nail. Gently file away excess from the nail edge using the light pink side of the file. I have to admit that I was a little intimidated by this process. Once I started, I realized how easy it was. I did have a slight problem with a few of the strips ripping when I pulled them off the backing, but I think it was because I was not paying enough attention when I was removing them. For your first time applying, take your time and be gentle with the strips. Also, you can use the cuticle stick to help you peel of the plastic covering if the tab is stuck to the backing. Overall, it was a pretty easy process. How long did I keep my Salon Effects? For 8 days. Did I remove them because they looked crappy and needed to be redone, no. I removed them because I was bored and ready for a nail change. I could have easily replaced the one or two nails that were coming off a little at the bottom and worn these for several more days. I just decided to move on. I have since bought 5 more boxes of Salon Effects (3 for me, 2 for my Mom) that I have found on sale. Trust me, these nail strips rock and you should try them asap. 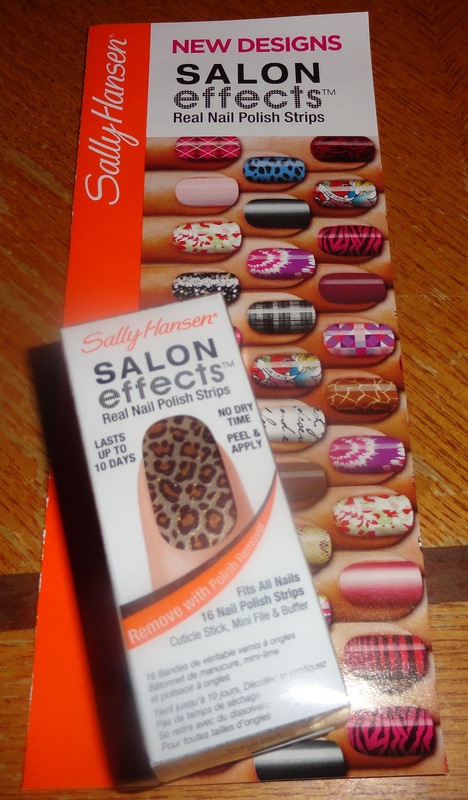 Disclaimer: I received a box of Salon Effects for free from Influenster to review. I was not compensated in any other way. All opinions are completely my own.